The Sea of Tranquility is on the Moon. It’s not a real sea, but a “maria,” one of the regions on the Moon that appear dark when looking at it. The surface speed record on the Moon is 10.56 miles per hour. It was set in an Apollo lunar rover. The size of the first footprint on the Moon was 13 by 6 inches, the dimensions of Neil Armstrong’s boot when he took his historic walk on July 20, 1969. The dark spots on the moon that create the benevolent “man in the moon” image are actually basins filled 3 to 8 kilometers deep with basalt, a dense mineral, which causes immense gravitation variations. The final resting place for Dr. Eugene Shoemaker – the Moon. The famed U.S. Geological Survey astronomer had trained the Apollo mission astronauts about craters, but never made it into space. Dr. Shoemaker had wanted to be an astronaut but was rejected because of a medical problem. His ashes were placed on board the Lunar Prospector spacecraft before it was launched on January 6, 1998. NASA crashed the probe into a crater on the moon on July 31, 1999, in an attempt to learn if there is water on the Moon. Contrary to popular belief, the Moon does have an atmosphere. It is very thin. If you took all of the molecules in one cubic centimeter of atmosphere from the Moon and lined them up, they would fit inside the period of this sentence. If you took a cubic centimeter of atmosphere from the earth at sea level and lined all of the molecules up, it would go from the earth to the Moon and back again two and a half times. The first spacecraft to send back pictures of the far side of the Moon was Luna 3 in October 1959. The photographs covered about 70 percent of the far side. In China, the dark shadows forming a face is seen as “the toad in the moon,” not the “man in the moon.” The toad is considered one of the five poisons of yin. It is believed that eclipses occur when the “toad in the moon” tries to swallow the moon itself. The temperature on the Moon reaches 243° F at midday on the lunar equator. During the night, the temperature falls to -261° F.
The first U.S. flag on the moon was deployed by Neil Armstrong and Edwin “Buzz” Aldrin during their historic EVA on July 20, 1969 (at 4 days, 14 hours, and 9 minutes mission-elapsed time). The U.S.S.R. captured the first photo of the moon taken from space in 1959. The image was of the dark side of the moon. 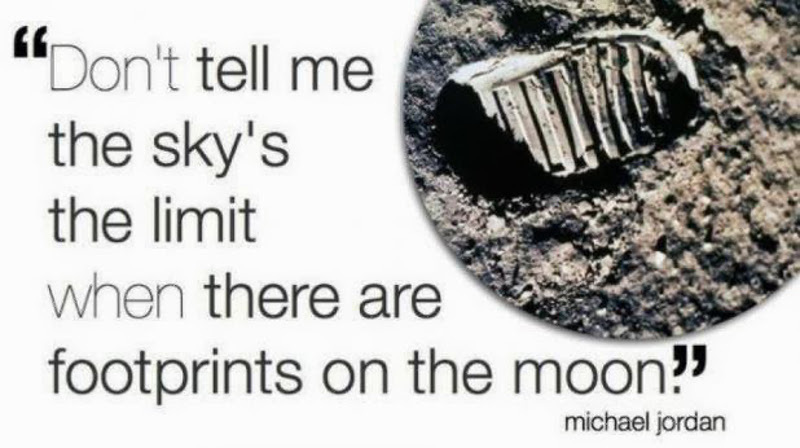 The footprints left by the Apollo astronauts will not erode since there is no wind or water on the Moon. The footprints should last at least 10 million years. The gold-plated 33-rpm record “Camelot” was left behind on the moon by the Apollo astronauts. The impact basin Aitken on the far side of the Moon is 2250 km in diameter and 12 km deep, making it the the largest in the solar system. When walking on the moon, astronaut Alan Sheppard hit a golf ball that went 2,400 feet, nearly one-half a mile. Astronaut and moon-walker James Irwin’s NASA name tag, coated with lunar dust, sold at auction for $310,500. The cloth keepsake, a 6- by 12-inch rectangle, was cut from the insulated jacket worn by Irwin during the 1971 flight of Apollo 15. Lunar dust, which created a dark gray tint around the tag’s edges, became embedded into the tag during three separate moonwalks Irwin took. His jacket and other equipment were left on the Moon to lighten the spacecraft’s load on the return trip home, but Irwin cut out and kept his NASA tag as a memento. Mare Tranquillitatis, or Sea of Tranquility, was the name of the first manned lunar landing. As of 1988, the U.S. census bureau determined that a stunning 13% of the population believe that some portion of the earth’s moon is actually comprised of cheese. The average desktop computer contains 5-10 times more computing power than was used to land a man on the moon. The multi-layered space suit worn by astronauts on the Apollo moon landings weighed 180 pounds on Earth and 30 pounds on the Moon with the reduced lunar gravity. You always get to see the same half of the moon because it is rotating at exactly the same rate it is moving around the earth: 29.5 earth days. This, however, is no coincidence since this match is caused by unequal mass distribution on the moon. Among the debris the astronauts have left on the moon are a number of golf balls. Gene Cernan was the last man to step on the moon in 1972. Baskin-Robbins introduced the flavor “Lunar Cheesecake” to commemorate America’s landing on the moon on July 20, 1969. Edwin “Buzz” Aldrin Jr. was the second person, after Neil Armstrong, to walk on the moon. In addition to the familiar features on the near side, the Moon also has South Pole-Aitken on the far side which is 2250 km in diameter and 12 km deep making it the the largest impact basin in the solar system and Orientale on the western limb which is a splendid example of a multi-ring crater. Due to its size and composition, the Moon is sometimes classified as a terrestrial ‘planet’ along with Mercury, Venus, Earth and Mars. The last man to fly in space alone was not Mercury astronaut Gordon Cooper, but Apollo 17 command module pilot Ron Evans, who circled the Moon alone while astronauts Gene Cernan and Harrison Schmitt went to the surface. If you added up the mass of all of the thousands of known asteroids in the asteroid belt, the total would be less than ten percent of the mass of the Earth’s Moon. Apollo Lunar Mission number 13, which was aborted while enroute to the moon in 1970 because of an explosion of a fuel cell in the service module, left the launch pad at 13:13 (CST) hours military time and the accident occurred on April 13. A cousin to the buckyball, a new molecular form of carbon known as the fullerene nanotube, can now be made in the lab. These single carbon molecules are so small that nanotubes sufficiently long to span the 250,000 miles between Earth and the Moon could be loosely rolled into a ball the size of a poppyseed. A quarter moon and a half moon are the same thing. The quarter refers to the fraction of the lunar month which has passed, whilst the half describes the portion of the Moon’s disc which is visible. The Apollo missions returned 2196 rock samples, weighing 382kg in total. There are over 500,000 craters on the moon that can be seen from the planet Earth. The largest crater that can be seen on the Moon is called Bailly or the ‘fields of ruin.’ It covers an area of about 26,000 square miles, about the size of West Virginia, and over three time the size of Wales. It is NOT TRUE that the Great Wall of China is the only man-made object visible from the Moon. It is only visible from a low Earth orbit, such as that of Skylab. From this height, many other human artefacts, cities, highways and field systems, also become visible. The Hubble Space Telescope can resolve features on the lunar surface down to 85 metres (280 feet) across. Its field of view is so small that it would take a mosaic of 130 images to cover the entire disc of the Moon. When the Apollo 12 astronauts landed on the moon, the impact caused the Moon’s surface to vibrate for 55 minutes.